Apply sophisticated words in the classroom. Use sophisticated words with your students. For example, ask students to illustrate instead of draw, tidy, instead of clean, collect, instead of take up. Talk about the din, raucous, or cacophony of noises heard in the hall or lunchroom. My favorite sophisticated word to use with my class was just a happy accident. After reading the word accolade in a story with my class, I now record on the board any accolades that my students receive from other teachers or adults in our school. My students now know and use the word accolade every day. Play games and do fun vocabulary activities. 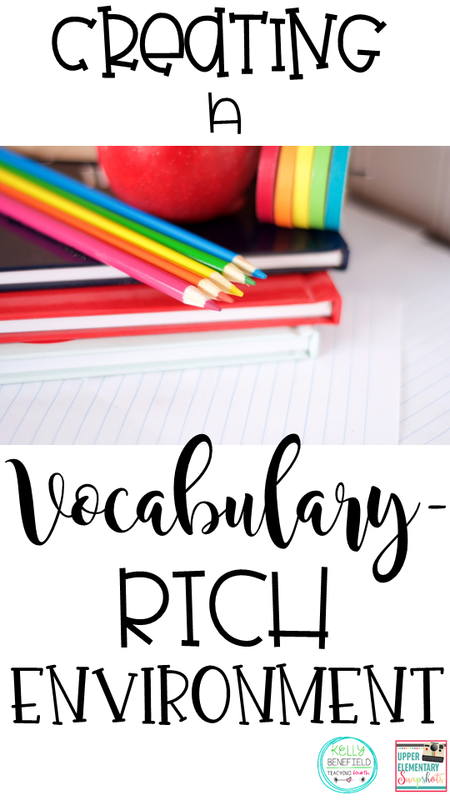 Visit my Upper Elementary blog post on 10 Engaging Vocabulary Activities that your students will love. Find fun vocabulary activities for your classroom. My students love spotting vocabulary words that we have learned in class in their library books and personal books. Encourage this vocabulary search by making a big deal when words are found. 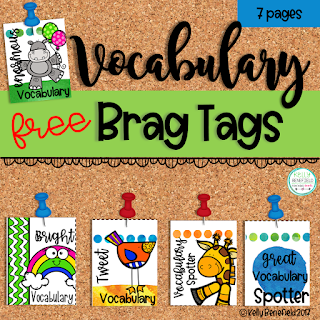 Give brag tags for Vocabulary Spotters (freebie found here or click the image below) and students will search diligently for these words. Varying vocabulary instruction and activities will help keep lessons new, fresh, and exciting for your students. For more ideas on creating a vocabulary-rich environment in your classroom, visit my blog post at Upper Elementary Snapshots. I don't know why I like index cards so much. I mean, I like them almost as much as Post-Its, pretty note cards and papers, and fancy notebooks. Yes, I admit, I hoard index cards! No, they are not very pretty or fancy, but they are the perfect size for so many quick and easy classroom activities that are sure to get your students motivated. Also, they are so inexpensive that it is easy to keep a lot on hand. I realize that technology is all the craze in classrooms across the country. 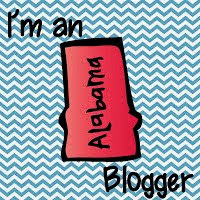 In fact, I am so proud to be a 1:1 classroom this year! I love technology, and my students love it, too! Even with all of the technology that we have available, I think it is important to provide students with a variety of fun activities to keep them motivated and excited about learning, and sometimes, even a simple index card can generate excitement in a lesson. Here are 7 ideas for using these inexpensive little cards. 1. Two Truths and a Fib. I have used this activity for many years on the first day of school, but this is also a great way to continue to get to know one another throughout the year. It is also is a fun way to cover some of the Common Core speaking and listening standards. If you have never played this fun activity, give each student an index card and instruct her to write 2 truths about herself and 1 fib. Then let each student share all three statements with the class and call on a classmate to guess the fib. You can also use this as an after activity for a lesson by having students list 2 truths and 1 fib about a topic they just learned or read about. Let them share with a small group and have group members tell the fib about the topic. This is a great closing for a lesson or unit of study. I realize there are wonderful and cute random name pickers on the web that are fun for the students, but sometimes as teachers, we just don't have time for all of that! Give each student an index card and instruct him/her to write his/her name in bold letters. Then draw and color pictures around to decorate the card. Take up the index cards to store in a container all year. Then, the next time you need to quickly and randomly select a student, simply draw one of these cards. Use these throughout the entire school year. O.K. This idea is not so much fun as it is a necessity. I don't know if your school is like mine, but my poor students have at least a half a dozen passwords that they are suppose to keep up with. To help them out, we have printed out passwords on stickers and placed on index cards for each student. These index cards are kept in special containers or in the students folders (depending on how often the passwords are needed). This has helped us out tremendously and kept searching for passwords to a minimum. 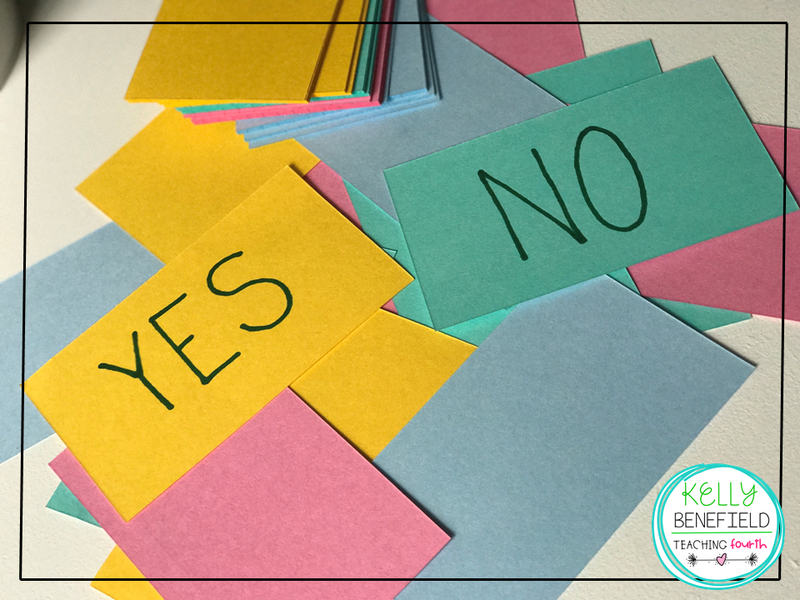 Let each student write "Yes" on one side of an index card and "No" on the other. Use these cards as a quick wrap up to a lesson or a quick review. 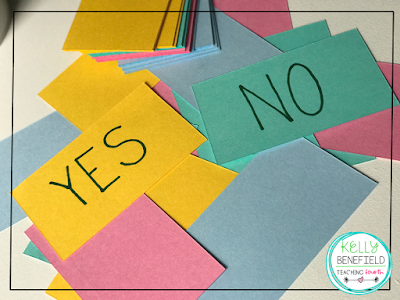 Call out a question related to the topic of study that has a yes or no answer. Students hold up the card to show the correct answer. You can quickly assess who understands and who may need to be pulled for small group instruction. True and false cards can also be made and used the same way. Use index cards to create a fun way to review sequence. After a read aloud, give students 4 index cards. On the first, write the title and on the other 3 write the beginning, the middle, and the end of the story. 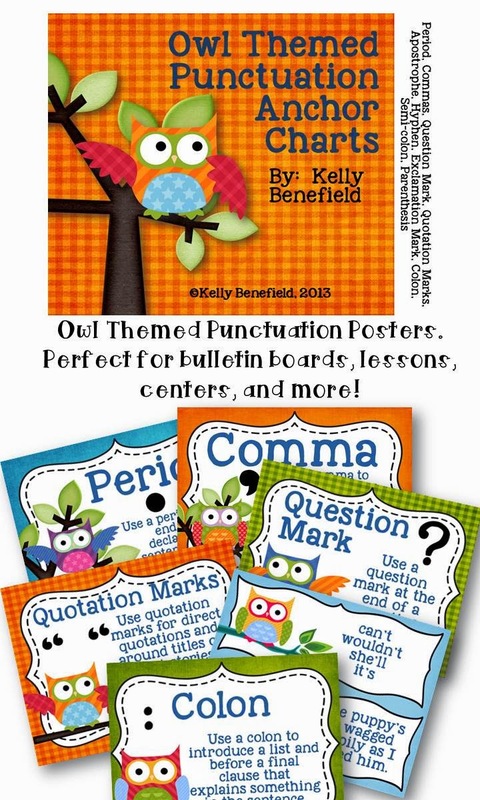 These make a great hall or bulletin board display! Read more about this fun activity here. Give each student an index card. Students should draw a diagonal line from the bottom left corner to the top right corner. On the top left side, students will write the vocabulary word and definition. On the bottom right side, students should draw a picture of the vocabulary word and use the word in a sentence. Just like the activity above, students can complete 3 or 4 cards and glue on a long strip of construction paper to display in the hall or on a bulletin board. This is a fun way for students to review vocabulary. Your students will enjoy summarizing a read aloud, a book from lit circles, or a book from independent reading when you give them an index card and one half of a 8.5 x 11 inch piece of paper. Let them draw a scene from the book on the piece of paper and write a summary of the book on the index card. Then simply attach the index card to the paper for a quick and easy hall display. Certainly, there are many other ways that index cards can be used in the classroom. I hope you have found one or two here that you may want to try with your class!